All transactions are safe and secure with a reliable history in online purchasing behind each of our associates. Buy the General Lee Dukes of Hazzard Hats to own Dukes of Hazzard clothing and merchandise. 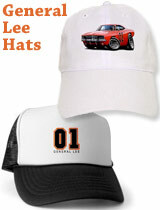 Cap off your favorite t-shirt from our gallery with a General Lee hat, including those pictured here. In addition to hats celebrating Bo and Luke's car, there are also other options like Cooter's Towing hats, Hazzard County Driving School and Boar's Nest hats. Wear one as you imagine yourself sliding across hoods, jumping through car windows and cruising the dusty back roads of Hazzard County. In addition to the General Lee Dukes of Hazzard Hats above, browse the Dukes of Hazzard Clothing Gallery for more apparel like men's and women's clothes, kids shirts or hoodies.